With Jet set to run out of cash in about a month, the carrier is now looking to restart talks with Tata Group. Jet reported its third straight quarterly loss in November as liabilities surged. It has fallen behind on payments to staff and lessors. 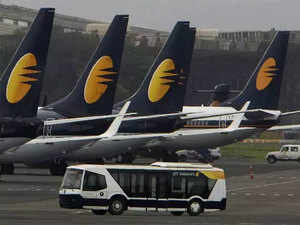 Jet Airways India Ltd., the airline which had its credit rating cut to default this month, is weighing a resumption of stake-sale talks with the Tata Group as the carrier is poised to run out of cash, people with knowledge of the matter said. While its founder and Chairman Naresh Goyal has been discussing a deal with Etihad Airways PJSC, talks with the foreign partner stalled over the latter’s demand that Goyal step aside from his management role, the people said, asking not to be identified as the discussions are private. With Jet Airways set to run out of cash in about a month, the carrier is now looking to restart talks with India’s biggest conglomerate, they said. Tata said in November that it held “ preliminary” talks with Jet Airways though no proposal was made. Acquiring Jet Airways’s business could give the conglomerate’s fledgling aviation unit a shot at dominating the fastest-growing major air-travel market, where fares as low as 2 cents have kept the industry unprofitable for a decade. A Jet Airways representative said the company does not comment on speculation, while Tata Sons didn’t respond to an email seeking comment. Goyal and Tony Douglas, chief executive officer of Etihad, which owns 24 percent of the Indian carrier, have met State Bank of India Chairman Rajnish Kumar multiple times to explore ways to keep the airline afloat, the people said. Creditors are open to lending $500 million to Jet Airways if Goyal and Etihad inject a similar amount into the company, the people familiar said. A decision will be made once a forensic examination being conducted into the airline’s books is completed, one of the people said. The Tata Group and lenders to Jet Airways have been in touch on the progress of discussions with Etihad, the people said. The Indian carrier missed an interest and principal repayment at the end of last year, giving it about 90 days to clear the dues and avoid becoming a non-performing asset. Credit assessor ICRA Ltd. cut its rating on Jet Airways’ loans and bonds to D, a score that signifies that borrowers are in default or are expected to be soon. Jet is the latest Indian airline in trouble. Kingfisher Airlines, founded by beer tycoon Vijay Mallya, ended operations in 2012 after failing to clear its dues to banks, staff, lessors and airports. SpiceJet Ltd. almost collapsed two years later before its founders returned to gain control and revive the company.